As Halloween approaches, spooky Los Angeles DUI stories are bound to start hitting the presses. Sure enough, two ridiculous and sad tales just popped over the past week. The first involved 26-year-old Catherine Butler, a Rochester, New York woman who earned internet notoriety after police arrested her twice in the span of just three hours for driving under the influence. 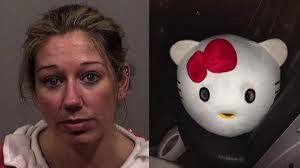 Meanwhile, up in Maine, police arrested non other than Hello Kitty herself for DUI. Authorities said that 37-year-old Carrie Gipson of Westbrook, Maine had been driving in the wrong lane while wearing a Hello Kitty costume. Police say she refused to take a breathalyzer test. They took her to Cumberland County jail, where she posed for a mugshot in her Hello Kitty costume (sans the giant Hello Kitty head). Whether you’re in costume or out of costume, authorities do not take DUIs lightly. Nor do they tolerate multiple arrests lightly. In fact, if you are convicted three times for DUI within a 10-year span (never mind a three-hour span), prosecutors can charge what normally would be a misdemeanor as a felony, meaning that you could spend over a year behind bars for a crime that ordinarily would only put you behind bars for a few hours or few days. In addition, a felony conviction can strip you of your right to vote, leave you with a permanent criminal record, and subject you to far more intense prosecutions if you’re ever arrested again for other crimes. An experienced Los Angeles DUI defense attorney with the Kraut Law Group can help you understand the extent and scope of your troubles and help you develop an intelligent, effective plan to get your life back on track. Attorney Kraut is an ex-prosecutor (Deputy District Attorney for Los Angeles) with excellent relationships with judges, prosecutors and police in the area.